Two of the world’s greatest storytellers have come together. One is Steven Spielberg, perhaps the greatest living master of cinema, and the other is Roald Dahl, whose books have caused the imaginations of children across many generations to run amok. It seems like a perfect match given their techniques and tendencies, and it’s almost surprising how Spielberg hasn’t adapted a Dahl story until now. His book of choice is The BFG, and on paper, his adaptation of the zany novel sounds like nothing short of a home run. Alas, the film turns out to be one of his weaker efforts – a visual treat boasting a pair of terrific performances, but marred by slipshod pacing and a mishandling of the book’s tone. The bright and confident Sophie (Ruby Barnhill) spends her nights looking after the English orphanage where she resides. Late one night, she steps out onto the balcony and makes eye contact with a giant (Mark Rylance). The giant swiftly nabs her and runs across the isle, eventually reaching the vast and wondrous Giant Country. 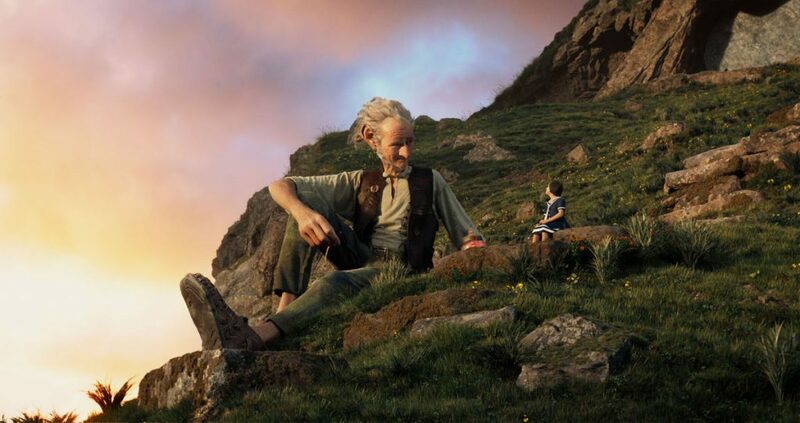 Initially fearful that she will end up as the giant’s snack, Sophie soon discovers that the giant – introducing himself as the Big Friendly Giant, or BFG for short – is actually a gentle and slightly dim-witted soul who does not eat humans. 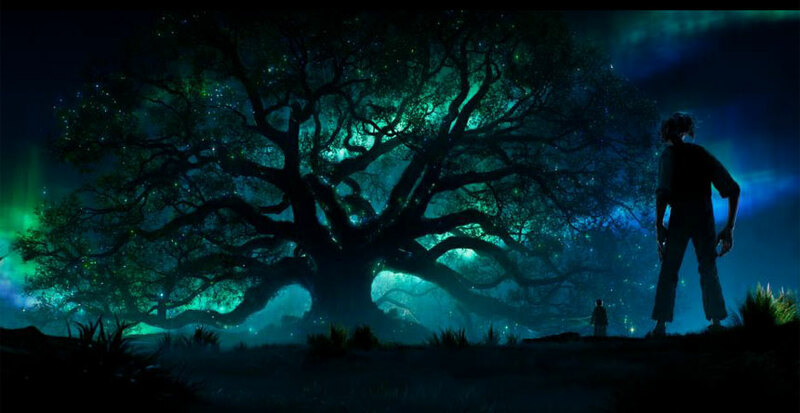 Quickly becoming his friend, she keenly observes BFG’s dream catching and delivering, and no longer feels alone. However, her big-eared friend isn’t the only inhabitant in Giant Country, as a group of larger man-eating giants led by Fleshlumpeater (Jemaine Clement) regularly bully him. 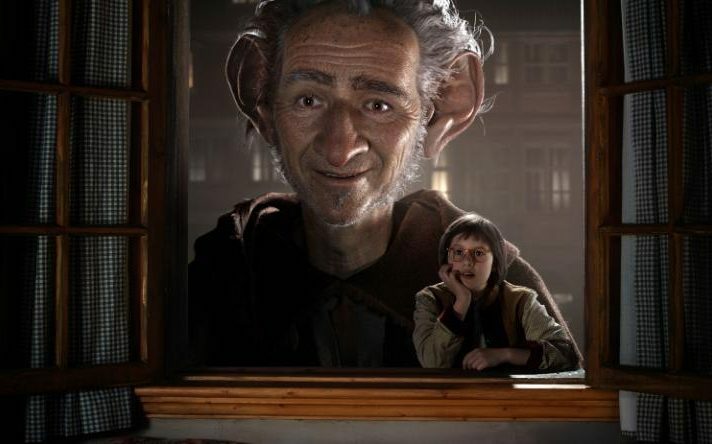 Angered by their behavior and treatment of BFG, Sophie begins to devise a plan to get rid of them once and for all. Scripted by the late Melissa Mathison (who wrote E.T. 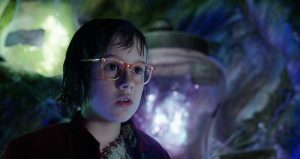 The Extra-Terrestrial), the film proves to be a faithful adaptation of Dahl’s novel that takes a few yet key liberties. The plot generally mirrors the book, and many delightful details – such as snozzcumbers and frobscottle – are thankfully retained. Retained too is Dahl’s madcap vocabulary, as evidenced by the BFG’s idiosyncratic pronunciation of certain words. The BFG himself is noticeably less energetic here compared to his book counterpart, reflecting what I assume is a storytelling decision to highlight his loneliness and timidity. Mathison leaves her own mark on the story by providing a delicate and moving – not to mention completely new – backstory for the character which heightens those very qualities. Her final touch comes in the film’s resolution, and I dare say that it’s better than the source material’s. What always struck me about the book is how carefully layered its tone is, which the film doesn’t capture. To see Dahl breathlessly and effectively cycle between humor, wonder, and terror is incredible, and while the filmmakers handle the humor and wonder fairly well, they completely ignore the terror, and doing so ends up muffling the picture. Spielberg’s natural ability to impart a childlike sense of wonder is at home here, as Sophie’s adventures in Giant Country enchants with each and every new discovery. The humor – particularly when it involves slapstick – is slightly amped to ensure maximum comedic delivery, and it generally works, though there are a few scenes that will elicit eye rolls and groans. As for the terror, Mathison and Spielberg render it absent, and as a result, the story is devoid of any peril. Say what you will about The BFG being a children’s book and movie, but having the tone slip into terror makes the material all the more compelling because it raises the stakes. 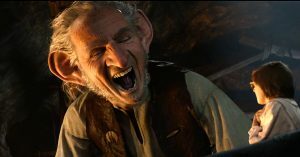 The BFG says that the giants eat humans, but leaving it at that doesn’t make them scary nor unpredictable, especially when they act like bumbling nitwits every time they’re on screen. The film wants us to regard the giants as a threat, but they’re never convincingly portrayed as such. 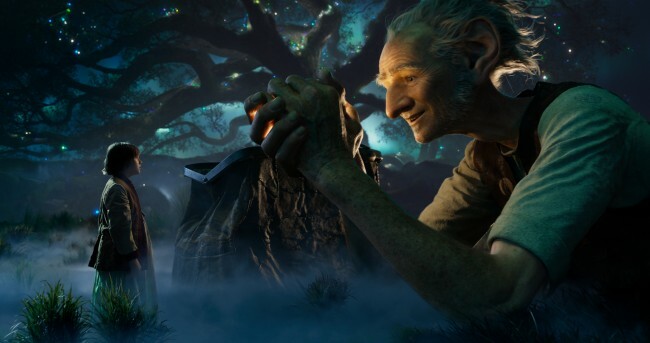 Even Sophie’s first face-to-face encounter with the BFG in Giant Country falls flat because her fear of being eaten isn’t driving that scene. Instead, it’s driven by humor, so it devolves into lighthearted banter, only for that fear to come up again minutes later – thus becoming a confusing tonal hiccup. Admittedly, The BFG is a difficult film to get into. Though it clocks in at just under two hours, it feels long, which is due to a rather dour and floundering first half. I would even go so far to say that it gets boring in some stretches, and those stretches tend to drag out for longer than necessary. Tonal hiccups or an inability to find energy and joy for the audience to hook onto tend to be the culprits behind such sequences, and it’s frustrating, considering that this is a film from one of the greatest cinematic minds. It comes as no surprise that the best scenes involve the characters having fun, and they come primarily in the second half, where the film is able to settle into a groove. Given that the entire story rests upon the relationship between Sophie and the BFG, they are the only characters who shine here, allowing the performances by Barnhill and Rylance to take off. Spielberg has a knack for getting the best out of his child actors and actresses, and the faith he places in Barnhill pays off immensely. Her effortless transitions between various composures and moods reflect both a surefire confidence and a deep understanding of the character, and it’s an all-around inspiring and spirited turn. Rylance has become Spielberg’s trusted go-to actor lately, and it’s easy to see why. 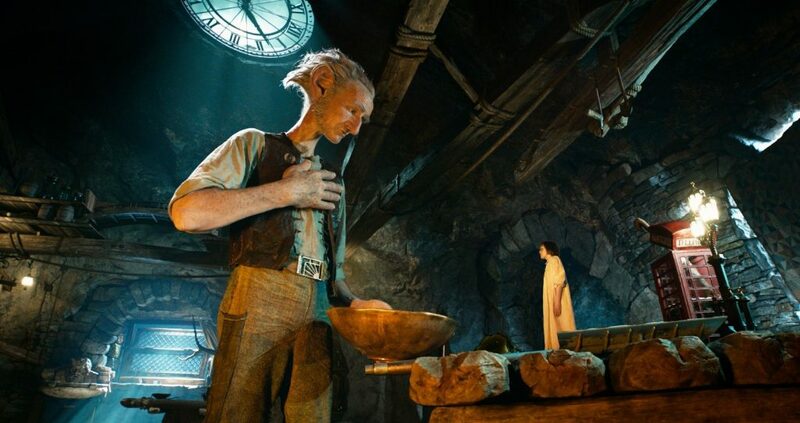 Not only does he nail Dahl’s language, he also turns in a wonderfully expressive motion-capture performance that naturally communicates BFG’s every emotion, both open and subtle; he’s near-heartbreaking in quiet moments and hilarious when he’s brash. Together, these two performers engage and bounce off each other with ease, so their chemistry is full of charm and heart. The other characters – as well as the cast members playing them – are either wasted or just don’t matter since they are thinly drawn or serve as mere plot devices. Dahl’s worlds are full of colorful characters, so it’s a bit of a shame to whittle them down instead of developing them and letting them breathe. A Spielberg-helmed film typically assembles artists who rank among the best in their respective fields, and this film is no exception. Weta Digital, one of today’s premier visual effects companies, does stellar work here with both the motion-capture performances and the CG environments, the latter of which burst with colors galore. 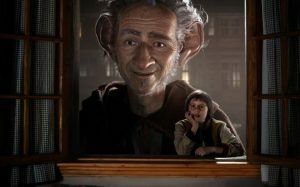 The BFG does slip into the uncanny valley when we first see him and Sophie in the same frame, and while he does look rather cartoony, Rylance’s emotional range comes through, selling the character very well. Cinematographer Janusz Kaminski’s camera follows the characters in a dreamlike manner, and production designer Rick Carter consistently aims to evoke a moody and almost nostalgic atmosphere. Composer and Spielberg regular John Williams opts to go with an effervescent, playful score that complements Sophie’s point of view as well as the BFG’s activities. The BFG is lower-tier Spielberg fare and an insufficient adaptation of one of Dahl’s great novels. It’s surprising that Spielberg – a master storyteller – doesn’t have a firm grasp on this particular tale in regards to flow and tone, which adversely affects the picture since not all of the necessary elements are present. The lead performances and the visual language are there, and Mathison’s slight changes to the source material work well. However, what’s missing is keenly felt, and the film as a whole feels incomplete and thereby forgettable. This entry was posted in Movies on July 8, 2016 by Jun I.